I have been looking for the perfect pair of red capri pants and when I saw that Hell Bunny released these ones I had to have them - they are fantastic and super comfy! 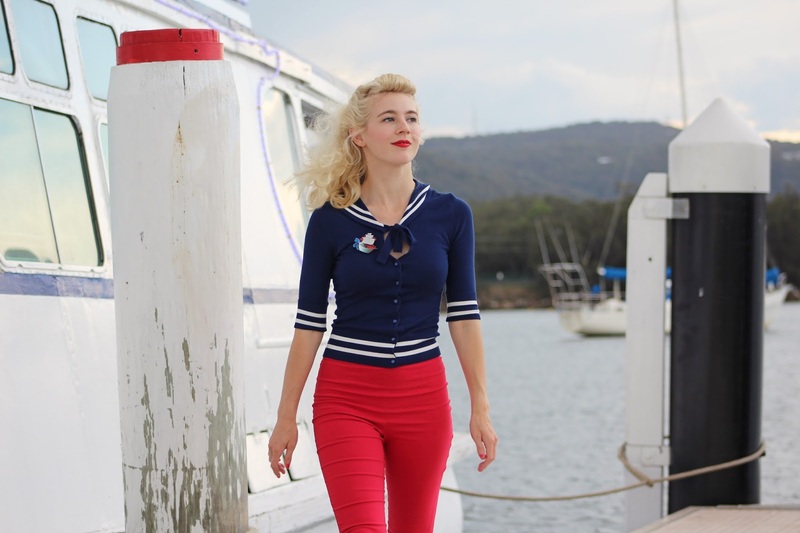 I couldn't help but wear this cropped nautical cardigan with them too. I really love the way this Erstwilder brooch pops with the whole outfit and it really stands out though still in quite a subtle way. 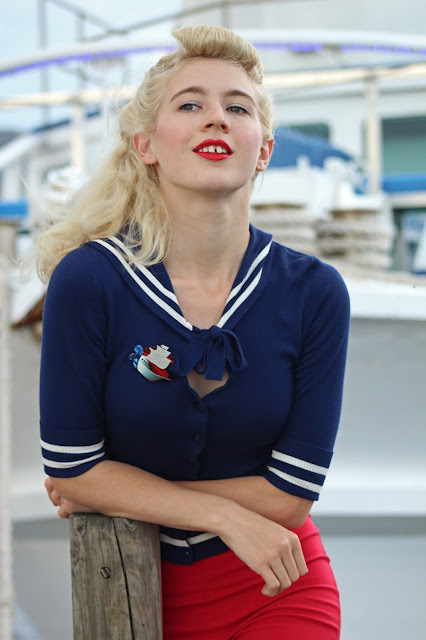 I usually like my accessories to compliment my outfits and I feel as if my Erstwilder brooches have done just that. 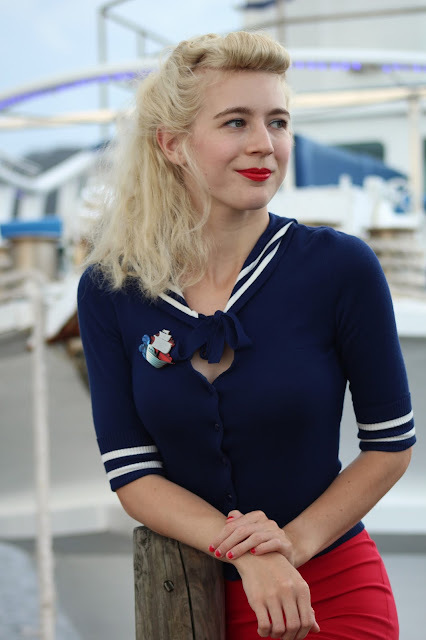 Before I owned any of these gorgeous brooches I was worried they might not fit in with some of my looks but I was completely wrong and love that they can be the finishing touch to an outfit or be made the focal point of a look. I personally like to choose them with either relevance to my wardrobe or my surroundings. The dogs were on this walk but didn't want to make an appearance in any photos, they happily watched and explored on the wharfs before we continued on our afternoon stroll. It was an overcast day and about to storm when we took these photos, there was also a beautiful breeze by the water (giving me a bit of crazy windswept hair) so it was a great opportunity to walk the dogs and wear this outfit. Luckily we were able to have a big walk and make it to the car before it actually started to rain. 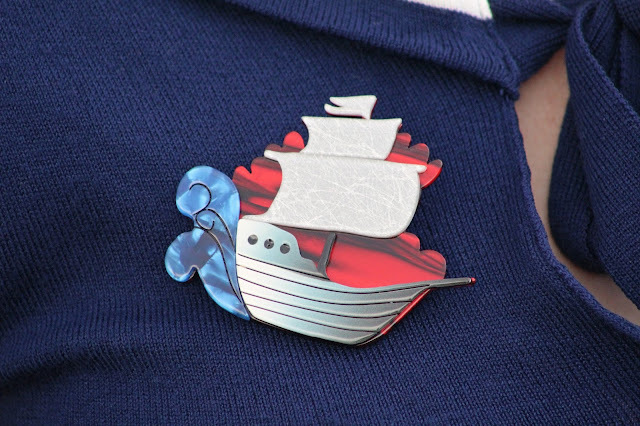 The Seafarer brooch is sold out on the website however the new Impossible Voyage Brooch is super cute too! Another important part of this post is to celebrate the newly released Erstwilder designs, I can't wait to style these four pieces from the new collection! Some of my favourites: Round the Twist, Ginger the Christmas Cookie, King of the Bush and Posh and Pooch. Find Erstwilder on their Website, Instagram and Facebook! I am already planning outfits to wear these beauties with and am excited to have a super cute Christmas brooch to wear during December. I am planning on making a new Christmas dress so I better get started on that soon. The time goes way to fast! Why do you always look so good in trousers.........? You can't go wrong with nautical red and blue! A perfect addition to your ensemble! I really love that gingerbread man one too! Too cute! I love your cardigan, great photos! 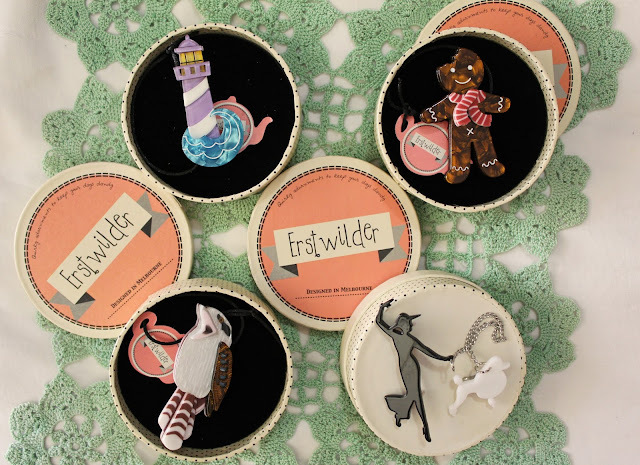 That gingerbread man brooch is so cute! !